Last weekend we competed at the Lenepe District Robotics Event in Tabernacle NJ. Our goal at the event was to perform well, show Gracious Professionalism and earn enough ranking points to qualify for the Mid Atlantic Robotics Regional Championship at Temple University on April 12th thru 14th. The results exceed our expectations, we won three awards and in addition, reached the semi finals—very unusual for a rookie team. On Saturday, our alliance won all 8 of our match's making us the only team with an 8-0 record. On Sunday we won 1 of 4 matches to finish overall 9-3. This ranked us as the best scoring rookie team and we won the Highest Rookie Seed Award. Balancing is becoming as specialty of our robot. 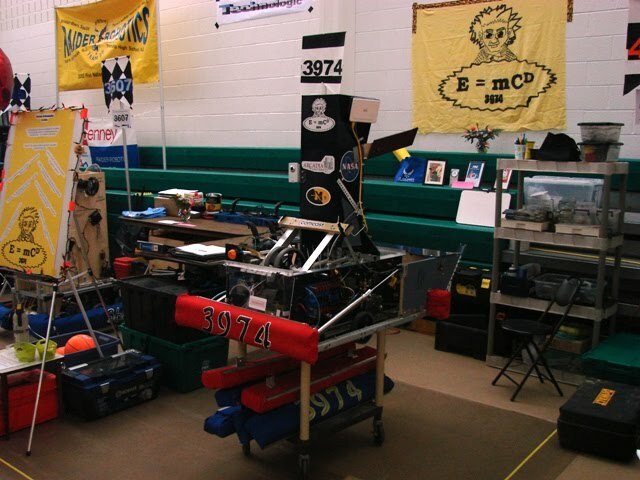 Analysis of match statistics show that when our robot is part of the alliance, the alliance is 18.0% more likely to perform a double balance than the average. We were selected for the elimination round of the competition. Unlike our last event, where we eliminated in the first round, this time we made it all the way to the semi finals. We took our opponents right to the limit. We lost the first match 64-61, won the second match (when we were able to do a double balance and our opponents could not), but we lost the final match. We were again awarded the Rookie Inspiration award, the same award we received at the Chestnut Hill Event. Winning this award gave the team an additional 2 ranking points toward Temple. Most surprisingly, we were awarded a third award, the Industrial Safety Award sponsored by Underwriters Laboratories. "The Industrial Safety Award celebrates the team that progresses beyond safety fundamentals by using innovative ways to eliminate or protect against hazards." This award was particularly sweet because we received some constructive criticism at the Chestnut Hill event from the safety judges. We took their advice to heart and our team safety captain Jess took the necessary steps to improve our safety processes. It is quite unusual for a Rookie team to win this award. Below is a picture of our 'Pit' area, notice how under Jess’s direction the pit is kept clean and safe. Based on our performance and awards we earned enough ranking points to make us a lock for the Regional Championships at Temple April 12th to 14th.